I can't seem to get an answer on stackOverflow so maybe someone here can help. 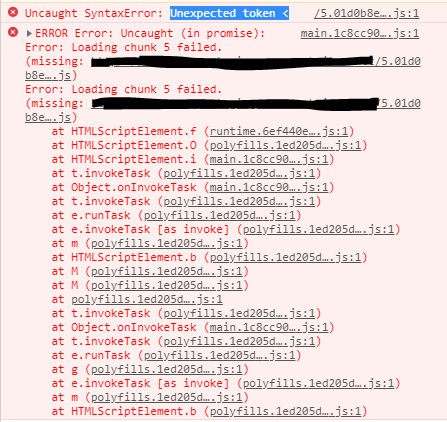 This question is https://stackoverflow.com/questions/55155359/unexpected-token-on-every-new-build-of-angular-production-pwa-until-site-ref it currently has a bounty on it, if someone wants to answer this there. and then as soon as I refresh the page, the site works as normal. Now my suspicion is that every time the app is updated, the main bundled js file changes, and the PWA has cached the old one and the app is still trying to use the new one. now this should check to see if there is an update and then just refresh the page.. but it doesnt seem to be working? so technically the first module the user gets to is the account module, but obviously it has to be redirected from the root module. Should I be putting the SwUpdate in the account module instead?? Are there any other solutions, is there a way I can just force the user to refresh on the first visit of my site?